The DCC was formed in about 1960 from the Northern Section of the Orpheus Caving Club. Since that time, it has grown to a membership of about 120. The members' interests range from pure caving for a sport through digging and surveying to mine excavation and exploration. The Club has also acquired equipment and records over the years and these are summarised in the pages under 'DCC information'. Members can get more detailed information in the members' area. 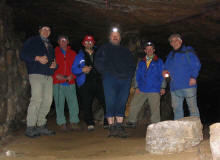 As well as cave and mine exploration, the Club is the base of a wide range of social activities shared not only among the members but also with members of other like-minded caving clubs. The social area of this part of the website will give further insight into what we do. One key social event is the Annual Dinner and non-members and members partners are particularly welcome. The Annual Dinner usually attracts about 60 people each year at different venues in the Stockport and north Cheshire area. The Club has been the "home" for many hundreds of people over the years and to reflect this, we have posted a number of pictures of members present and past, some deceased. This "rogues gallery" needs updating from time to time so if you want to add your picture (even if you are no longer a member) or want your picture changed or removed, just get in touch with the Webmaster through the normal routes. If you are a member, then you will find out a lot more about the Club in the members' pages. To reflect the range of interests, this site has been built in separate parts covering the caving and the Alderley interests. In this part of the website, we have put information about the Derbyshire Caving Club and its activities in caves and mines other than Alderley Edge. There are also links on most pages to other sites of related interest. We hope you enjoy your visit. The pictures on this page were taken in Holme Bank Chert Mine in Derbyshire (top) and in West Mine (bottom) when we celebrated a member's 60th birthday.